It’s that most wonderful time of the year when you think about holiday gifts that will make your favorite coworkers feel appreciated—and then draw a complete blank on the perfect gift to give them. 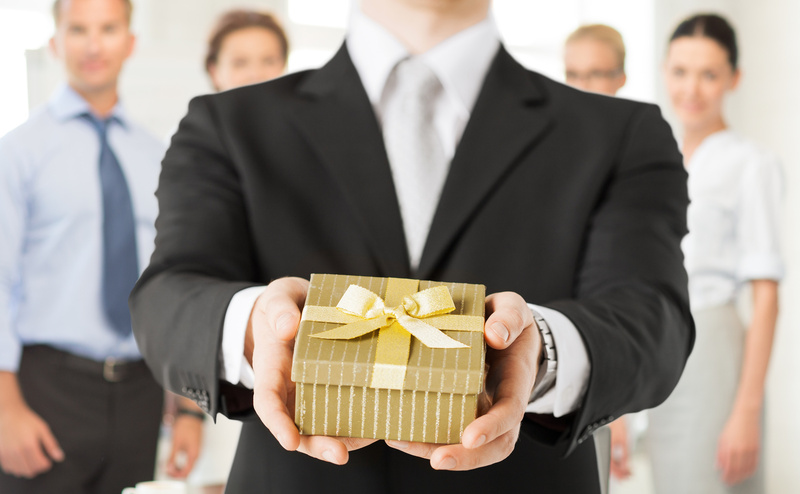 Giving gifts to government colleagues isn’t straightforward. At the federal level, strict rules govern gifts between government employees*, putting a $10 limit on your generosity. If you work for a state, regional, or local government, chances are your agency has similar ethics rules and spending limits for holiday gifts. And, while you can give a more expensive gift to an office to share, it’s time consuming to wade through gift baskets to find the perfect one that everybody will appreciate. This gift guide solves your holiday shopping problems. It’s filled with lots of fun and meaningful treats for your hard-working government colleagues that don’t violate the ethics rules. * Prices are as of November 15, 2017, might change, and may not include shipping and taxes. * I’m not a lawyer or ethics expert. When in doubt, check with your agency ethics official. 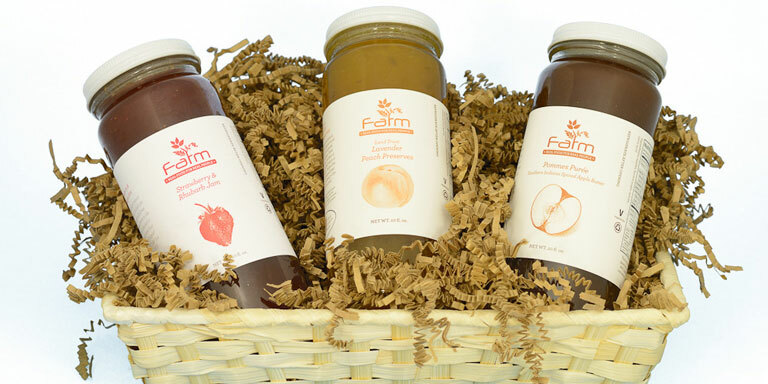 Give your coworkers a gift that can perk up their desk and add flavor to their meals. Cultivate and Eat kits from Apollo Box come with everything your coworker will need to cultivate delicious, healthy Japanese greens from seed. The plants start off right in the bag and then can easily be transplanted into large pots as they grow. 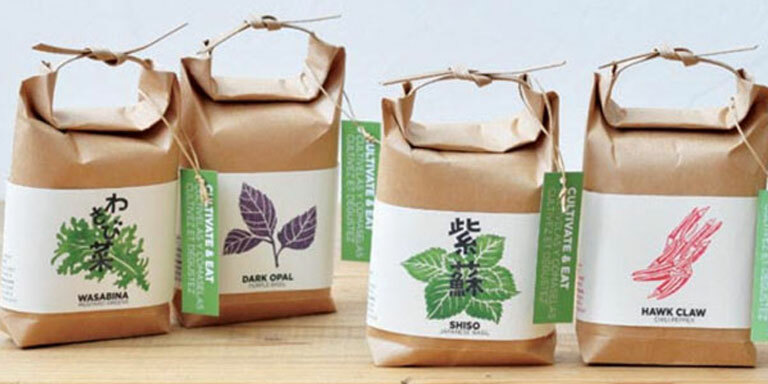 Choose from shiso (Japanese basil), wasabina (mustard greens), dark opal (purple basil) and hawk claw (chili pepper). These days, a lot of people are making a positive change in their lives and eating healthier portions. 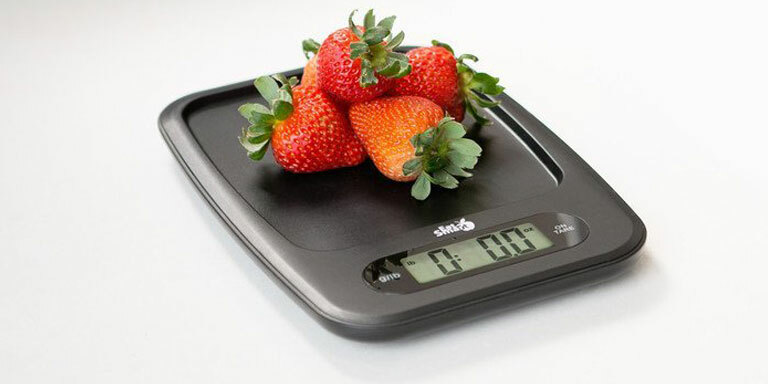 After overindulging in holiday treats, folks will also appreciate the EatSmart Precision Digital Kitchen Scale. It features a slim, modern design that can easily be tucked into a desk drawer or stored out of the way on a shelf. The scale’s recessed platform keeps foods from rolling away, whether you’re weighing a handful of antioxidant-packed blueberries or of some jellybeans. 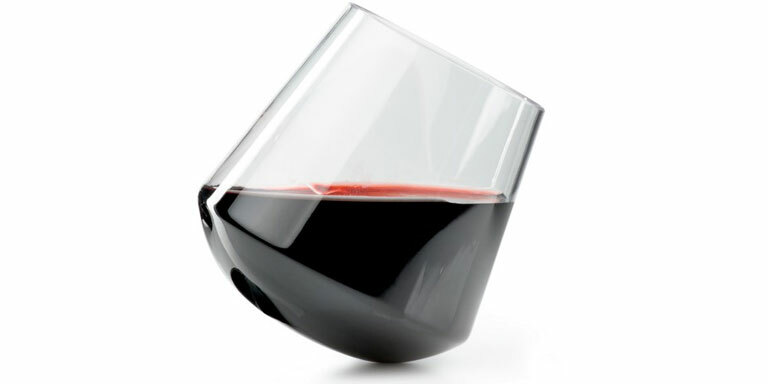 The stemless design of this generous red wine glass creates a very low center of gravity for surprising stability even on uneven surfaces like a picnic blanket or a towering pile of papers on an office desk. Get one Stemless Wine Glass from GSI Outdoors for your favorite coworker and another one for yourself, that way you can get together and raise a glass to the end of a long work week. 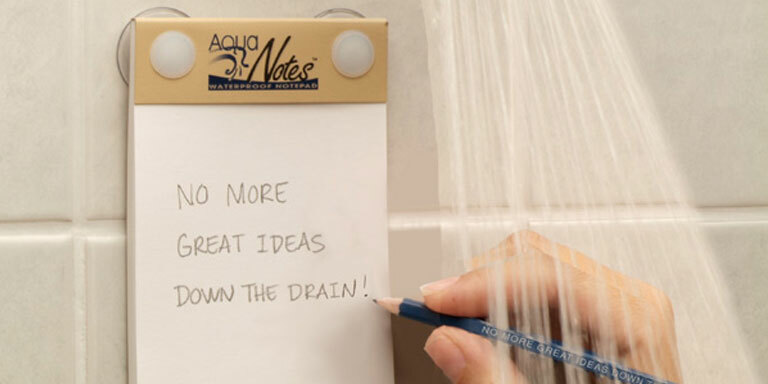 AquaNotes Waterproof Notepad suctions to the shower wall and gives thinkers a place to write down their thoughts before they’re gone. The waterproof note paper is recyclable and non-toxic. Give this waterproof notepad to your creative coworkers so they can record their best ideas and inspiration. 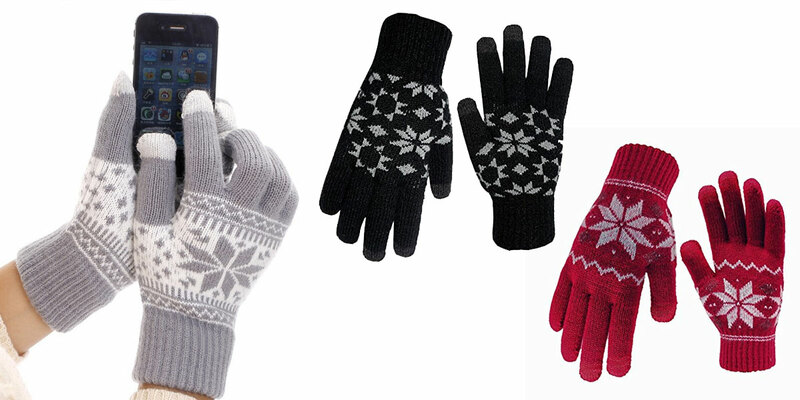 During the colder months, your coworkers will be grateful for a gift of gloves that allow them to stay warm while they text, type, and swipe on their smartphones and tablets. Available in many styles and colors, these affordable touchscreen gloves have conductive material on the three fingers people use on their screen. Personal safety is a valuable gift. Many people government would like a little reassurance in case an emergency happens. 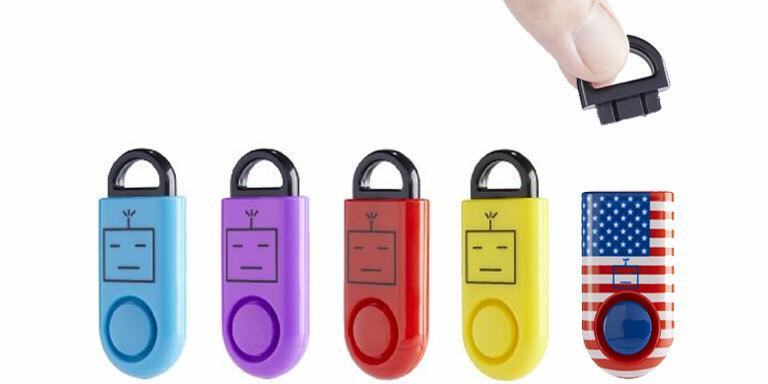 All they need to do is pull the pin on the B A S U eAlarm and it emits a 120 decibel (ambulance-level) siren for 30 minutes, until the pin is inserted back into to the device. This tiny alarm weighs less than 1 ounce, and operates at temperatures ranging from 14° to 104° Fahrenheit. This Bag of Edible Bugs can either be a surprising white elephant entry or the perfect gift for an adventurous foodie coworker. Bugs like crickets, grasshoppers, silkworms, and sago worms are tasty and nutritious, packed with healthy protein. 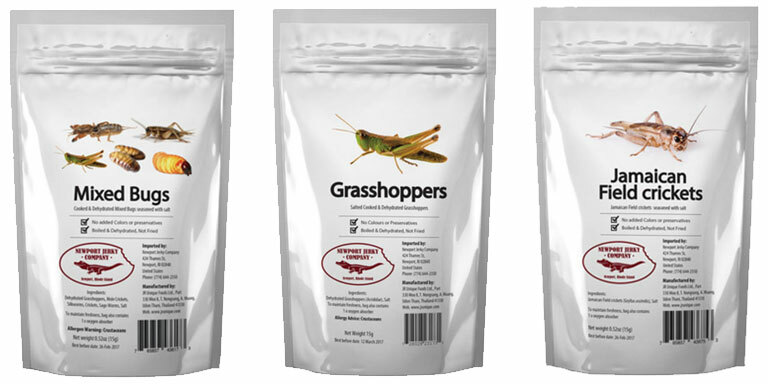 Choose a bag of mixed orthoptera, Jamaican field crickets, grasshoppers, or mixed edible bugs. Sold by Apollo Box, the bugs are cleaned and farm raised, hand crafted in small batches, and USDA and FDA approved. Your outdoorsy coworker will be able to take their coffee straight from the desk to the trail in the Infinity Backpacker Mug. 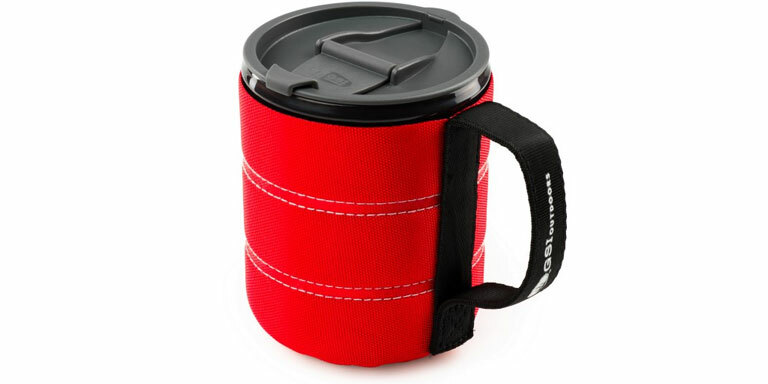 This lightweight mug comes with a snap-close lid and a flexible handle, so it fits in a lunch bag, briefcase, or purse. Made of durable, non-leaching, recyclable polypropylene, this 17-ounce mug comes with an insulated sleeve to keep liquids hot or cold. Available from GSI Outdoors in four colors: red, green, blue, and orange. Check lists isn’t a chore and project planning isn’t a bore when you use Knock Knock’s pads and sticky notes. 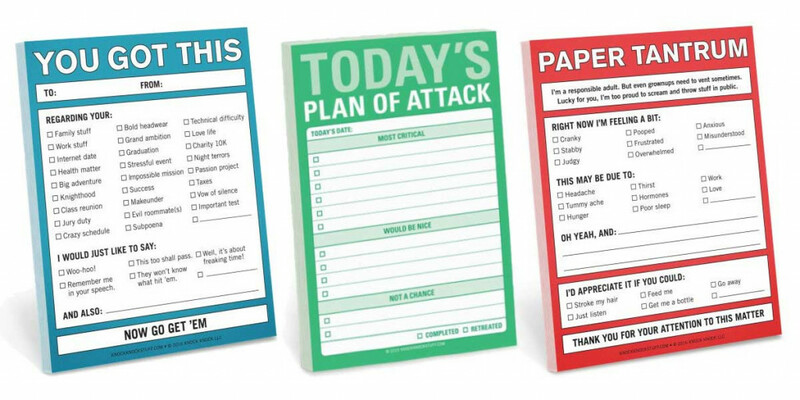 Hilarious and yet (mostly) safe-for-work choices include You Got This, Action Items!, Brain Dump, Paper Tantrum, Self-Therapy Note, Make A Decision, and Today’s Plan of Attack pads. 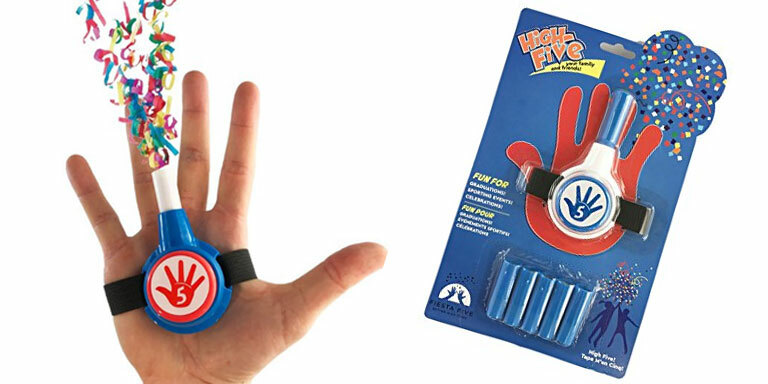 Spread cheer around the office by giving your coworkers the FiestaFive, a hand-held confetti blaster. Just strap the balster to the palm of your hand and high-five a friend, and you’ll all be showered in celebratory confetti. Each blaster comes with six cartridges of colorful, biodegradable confetti, and you can always order refills. Today the smartphone is the only camera most people one. 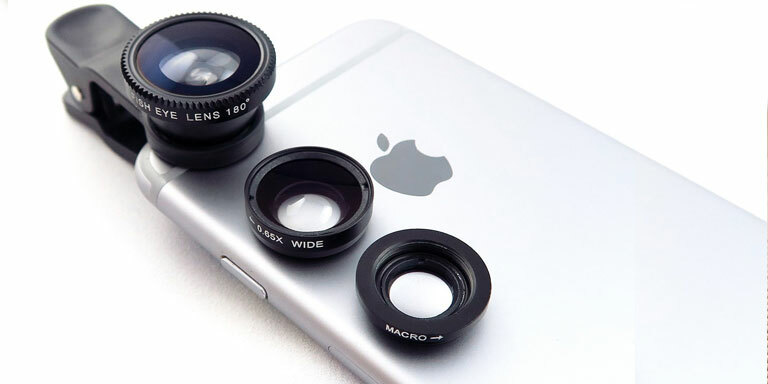 This camera lens kit easily clips a phone or tablet and transforms the camera lens to make photography more fun. Use the wide angle lens to capture cityscapes and landscapes, the macro lens to photograph flowers and objects up close, and the fisheye lens for fun selfies and scenes. Now, we’re not condoning drinking in the office or slipping booze into the punch bowl at the office holiday party. This hip flask is meant to be enjoyed outside the office. It’s lightweight and low-profile, so it’s easy to carry around. 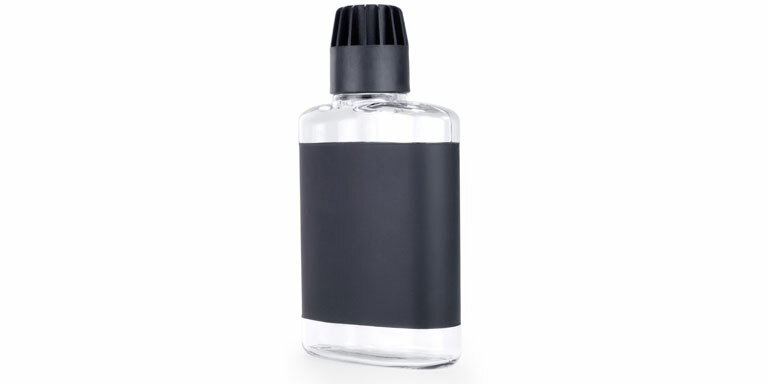 Since the flask crush resistant, it won’t get banged up wherever your takes it. 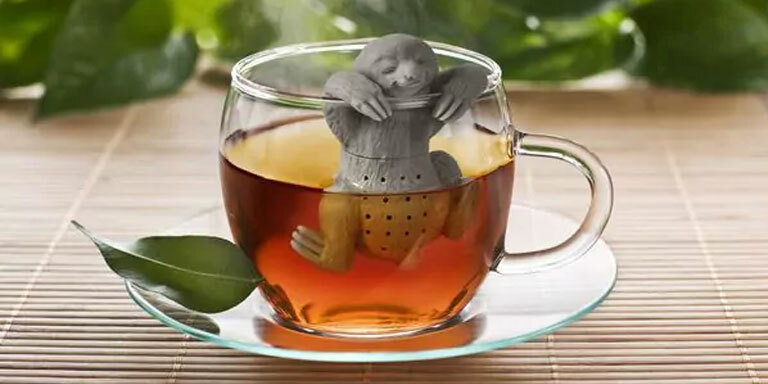 Remind your harried coworker to take a break from their frantic pace with this delightful Sloth Tea Infuser. Pack it with tea leaves and it makes a perfect cup of tea. The cute guy is made from heat resistant, BPA-free silicone and hangs patiently on the side of the mug. 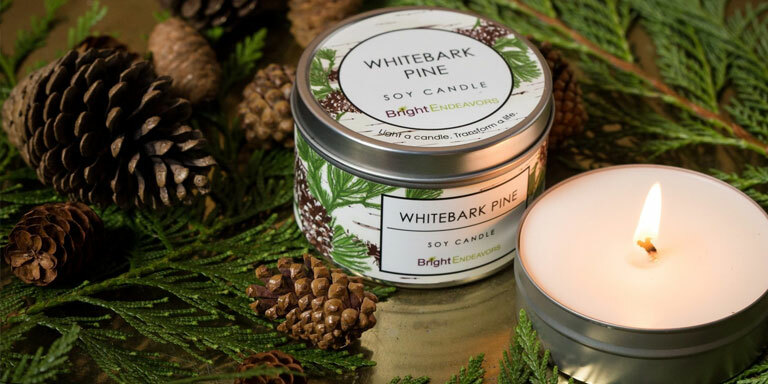 Chicago-based Bright Endeavors candles come in seasonal scents like almond berry galette, pumpkin chai, holiday citrus, and whitebark pine. You can feel good buying these candles because they’re created by young moms learning job skills and made with non-GMO soy wax, paraffin-free wicks, pthalate-free fragrances, and recycled glass containers. Foam-shooting guns probably aren’t suitable for government offices. But an adorable animal that pops foam balls out of it’s snout? Yes, please. 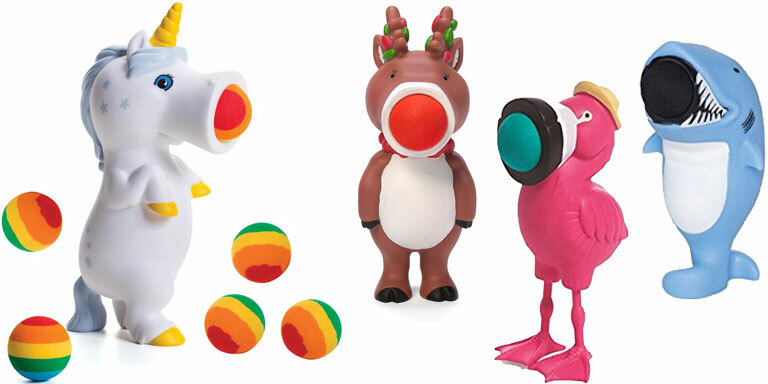 Choose a Hog Wild foam popper in the shape of a unicorn, squirrel, penguin, reindeer, shark, flamingo, and more. 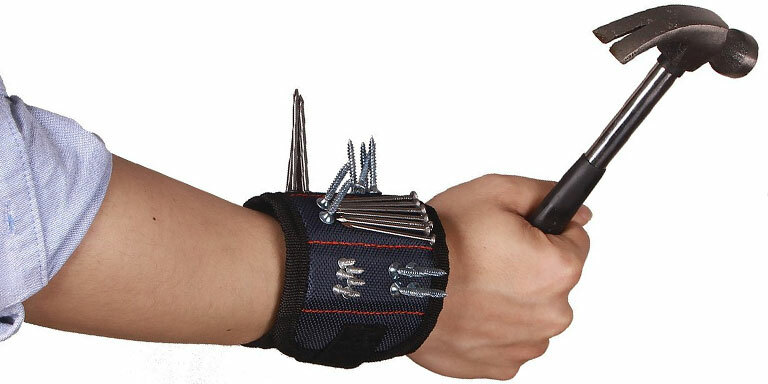 Wearing this magnetic wrist band is like having a third hand to help with hands-on projects. It provides a convenient spot to store nails, screws, drill bits, and any other small magnetic items you don’t want to risk losing. The magnetic wrist band is perfect for coworkers who enjoy computer electronics repair or other do-it-yourself projects. Give your coworker a way to transform themselves with Tattly temporary tattoos. The tattoos are safe and non-toxic, and last on average 2 to 4 days. 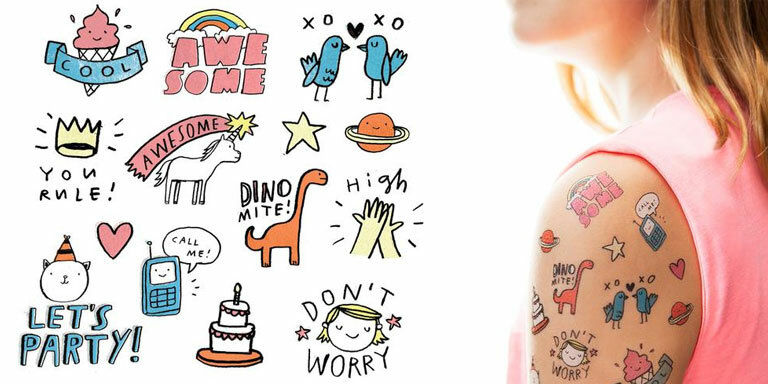 Look through the Tattly collection for the perfect temporary tattoo for your colleague. Give a gift that helps your coworker relieve stress. 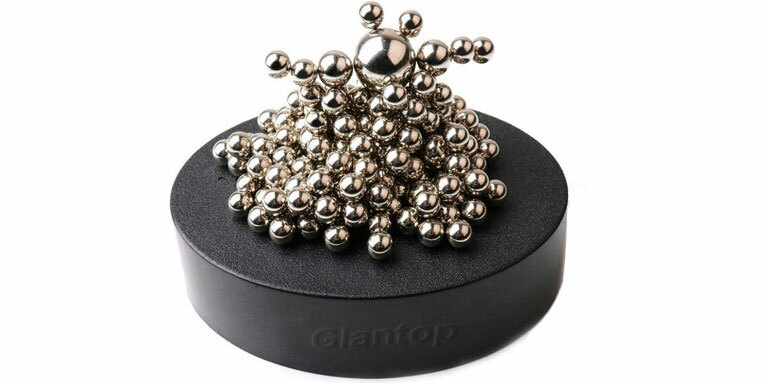 This magnetic sculpture desk toy comes with 160 stainless steel balls of different sizes that can be creatively reconfigured into all sorts of shapes on the magnetic base. 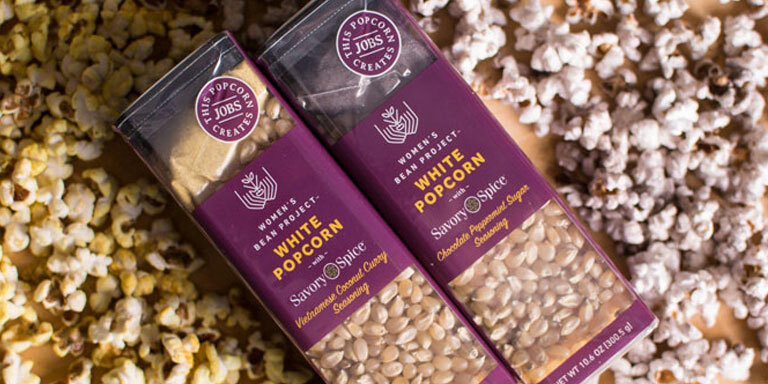 Women’s Bean Project, which helps impoverished women learn employment skills, offers a variety of tasty seasonal popcorns in fun flavors like White Popcorn with Chocolate Peppermint Sugar Seasoning, Blue Popcorn with Salted Caramel, White Popcorn with Vietnamese Coconut Curry Seasoning, and Rainbow Popcorn with Salt & Pepper. Women’s Bean also offers hand-packaged gift baskets and gift bundles. The first rule of holiday gift giving is that picky people get gift cards. But, it’s not easy to find gift cards for $10 or less, no less ones that your coworkers will actually like. The secret is to buy a variety of multi-packs of gift cards and distribute the cards to multiple people. 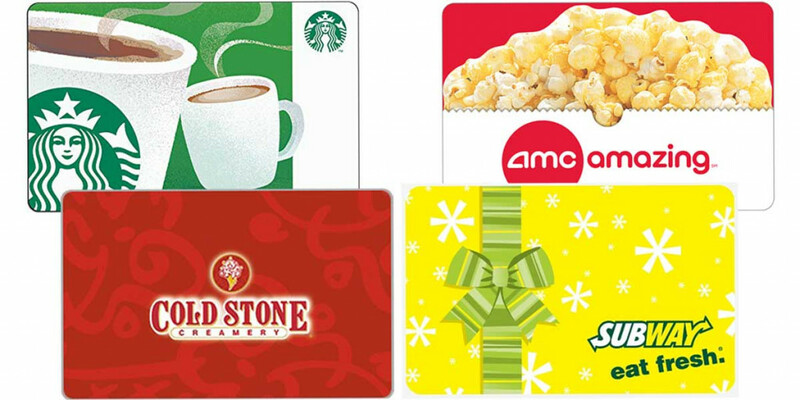 Gift cards from Starbucks, Subway, Cold Stone Creamery, and AMC Movie Theatre are bound to please. Fuego Box has the holiday gift for the co-worker who loves to spice up everything they eat. The tongue-tingling Hot Sauce of the Month Club boxes are packed with artisanal, small-batch, and unique hot sauces that range from mellow to extra spicy. Choose between three bottles of hot sauce every month, three every quarter, or one special spicy bottle per month. 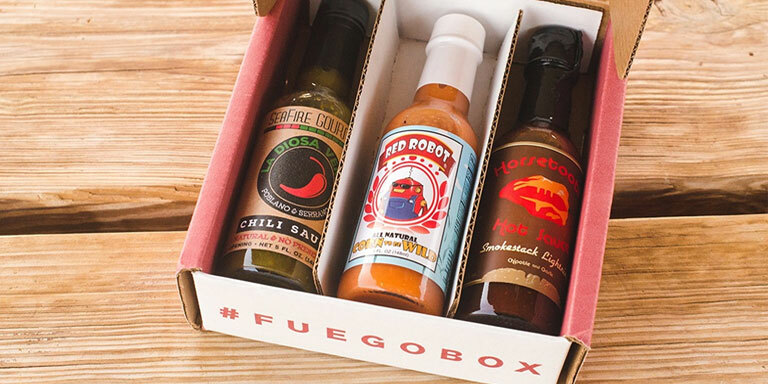 Fuego Box also offers a wide variety of flavorful hot sauces and one-time gift boxes that can spice up anyone’s life. FARMbloomington Restaurant in Indiana, creates stylish and unique culinary experience. Created by internationally recognized Chef-Owner Daniel Orr, the restaurant serves gourmet farm fare prepared in innovative ways. For those who want to bring a bit of FARMbloomington into their home, Chef Orr offers original recipe condiments, jams, and spices—the perfect addition to any cook’s cabinet or an ideal gift for coworkers. The Land Trust Lavender Peach Preserve, Attitude in a Jar mustard, and gift baskets are especially tasty treats to share with the office. Rejoice! 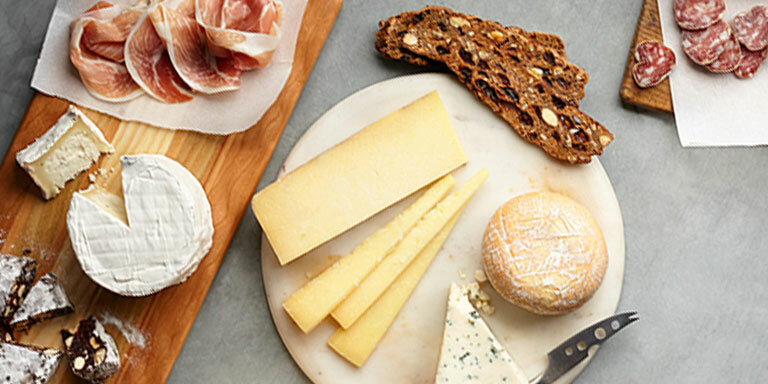 Cowgirl Creamery’s award-winning cheeses can be shipped to your coworkers, family, and friends. Go with a gift box of nothing but cheese, or choose one that adds in accompaniments from the California coast, like crispy crackers, cured meats, and olives. Based in California, Cowgirl Creamery is an artisan cheesemaker that works with small, local farms. Give the office a way to start the day with a healthy, convenient treat. 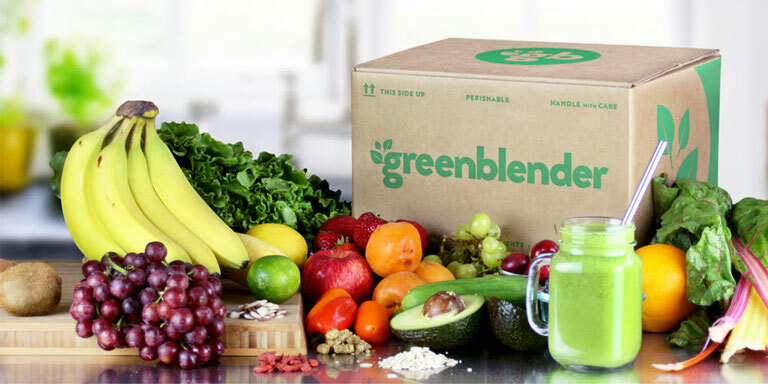 GreenBlender is a smoothie delivery meal kit service that delivers a box filled with all the fruits, vegetables, and superfoods people need to make refreshing smoothies like Butternut Chai, Pineapple Mulberry Persimmon, and Pumpkin Seed Beet. They’ll get 5 smoothie recipes and ingredients to make 10 servings. Choose from weekly, monthly, and 12-box subscriptions. Share some festive Southern flair around the office with a River Street Sweets • Savannah’s Candy Kitchen’s gourmet Southern holiday candy gifts. 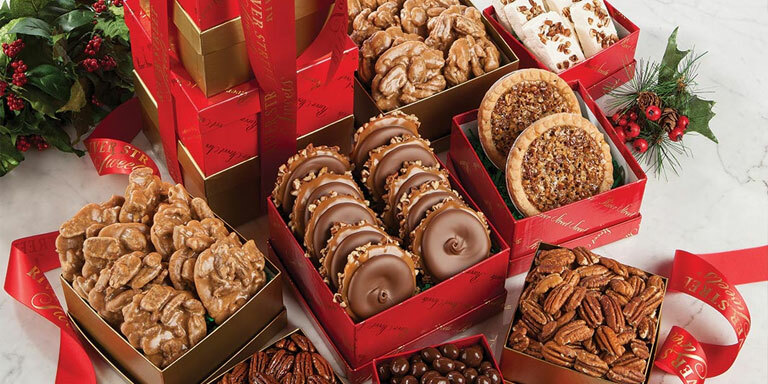 You’ll want to make sure you pick a gift box that includes their world famous pralines. Each sweet treat is handmade in small batches with a 40-year-old family recipe. Check out their bakery selection for indulgent pecan pies, red velvet cakes, and chocolate bear claw kringles. 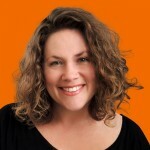 Lauren Girardin is a marketing and communications consultant, freelance writer, and speaker based in San Francisco. She helps organizations, foundations, and companies with a conscience engage their communities and tell their stories. Her website is laurengirardin.com and you can connect with her on Twitter at @girardinl. Nice assortment of practical and whimsical gifts. Will help me in my shopping this season.